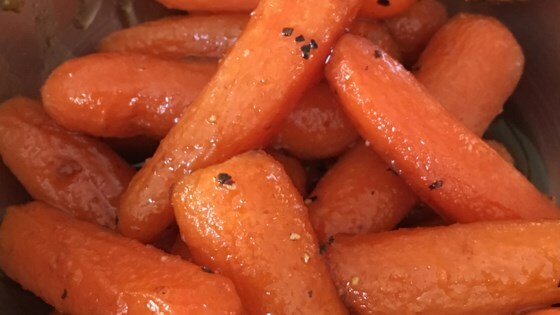 "Carrots are tossed with olive oil, cumin, and honey in this simple, easy, and yummy side dish." Put carrots into a large sealable plastic bag; add honey, olive oil, cumin, salt and black pepper. Seal the bag and manipulate the contents until the carrots are completely coated; pour into a baking dish. Roast in the preheated oven until just tender, or to your desired degree of doneness, 30 to 40 minutes. Very nice indeed. The only change I would make in the future is to add a small amount of cayenne to enhance the flavors. Thanks for sharing. Turned out perfect. Did add a 1/4 tsp of Cayenne pepper as suggested. Perfect just as stated! My son that won’t eat cooked carrots really liked them and finished his. Good mix of flavors. The most recent time I made these I overcooked the baby carrots until almost burned but the sugar and butter carmelized to a candy coating. Recipe was quick, easy, super tasty. I boil carrots for 15 minutes before baking them and leave them in the oven, temp off until they shrivel a little bit. Huge hit! Didn't have any cumin so Smoky Paprika was used and it was delicious. My wife loves them and next time I'll use the cumin.